Ancestry® Library Edition, distributed exclusively by ProQuest and powered by Ancestry.com, delivers billions of records in census data, vital records, directories, photos, and more from countries all over the world. The Home and Search tabs allow you to search across all data collections in Ancestry Library Edition, including immigration and travel records. 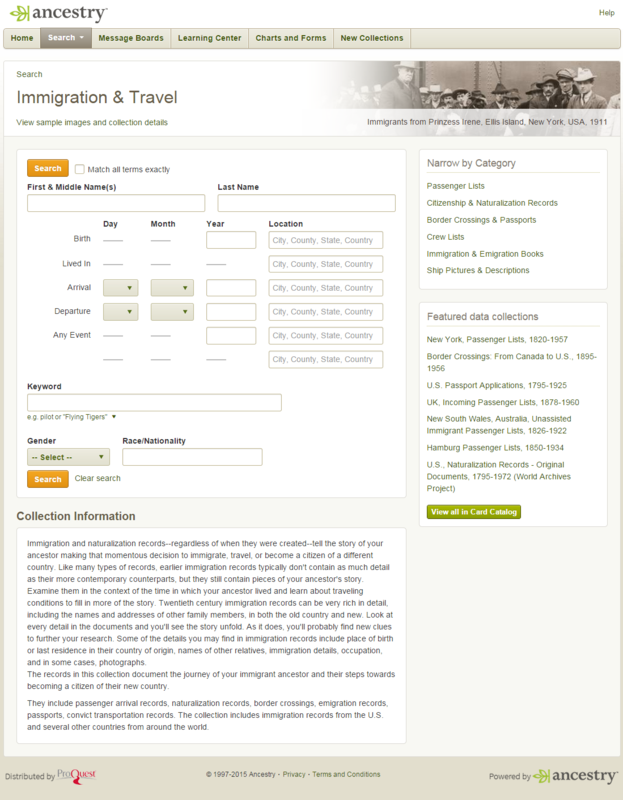 Locate and click on "Immigration & Travel" on the Search tab drop-down menu to use search fields specific to these records and narrow your search to only these types of records. Using the Card Catalog link (Search drop-down menu or right link on Search page) or button (bottom right of Search page), filter the list of data collection to view only these records. The records in this collection document the journey of your immigrant ancestor and their steps towards becoming a citizen of their new country. They include passenger arrival records, naturalization records, border crossings, emigration records, passports, and convict transportation records. The collection includes immigration records from the U.S. and several other countries from around the world.